The Samsung Galaxy Note II retail package includes a wall-mount charger, where you plug the supplied microUSB cable to charge your phablet. There's also a nice one-piece headset with several spare earbuds (so you can find the right size for you), identical to the one found inside the Galaxy S III retail package. 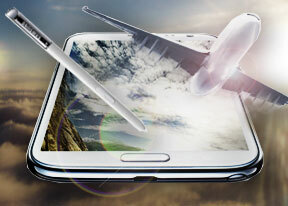 That’s all the basics covered, considering that the Note II offers ample storage out of the box. The bad news is that the MHL adapter required for HD TV-out and the USB adapter enabling the USB host functionality aren’t included. It’s a real pity – both work pretty well but this way some users will probably not bother purchasing them and won’t get a chance to try them. The Samsung Galaxy Note II N7100 measures 151.1 x 80.5 x 9.4 mm, which makes is slightly taller, but narrower and slimmer than its predecessor. And while it is notably larger than even the biggest droids with their 4.7-4.8" screens, the Note II is reasonably easy to fit in a pocket. Note: Due to a slight mistake in our formula the Samsung Galaxy Note II endurance rating came out slightly higher than it actually is. We are sorry about this and we'll do everything we can to make sure it doesn't happen again. See the revised scorecard below. We ran own tests and the results are quite impressive. 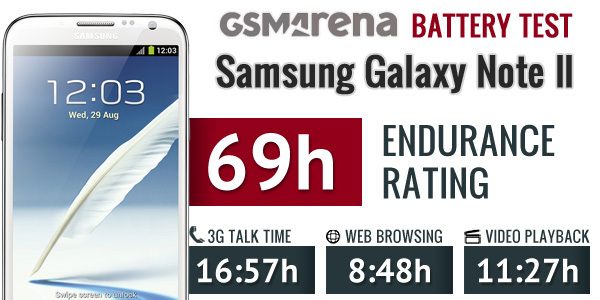 The endurance rating of the Samsung Galaxy Note II came out as 69 hours or just over three full days. This is how long you can go without charging the device assuming your usage is an hour of calling on a 3G network, browsing the web for another hour then watching an hour of video each day. That’s certainly one of the most impressive scores we have seen and it proves that the Samsung Galaxy Note II is not only an extremely capable droid, but also one that be with you for a long time, before it makes you run for a charger. You can get more info on the tests results from our blog post or if you want to learn more about our battery testing routine you can follow this link. After using the Note II for a while, even the massive Galaxy S III feels small (the flagship smartphone being 1cm narrower than the phablet). The difference in screen size is quite notable too - we were quite reluctant to switch back to the smaller screen. However, this is not to say the Samsung Galaxy Note II is impossible to pocket - tight jeans might not make it feel at home, but with average or larger pockets it's entirely possible to carry it around like any other phone.